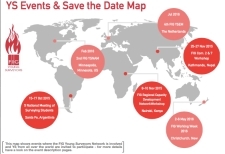 To increase co-operation between the commissions and the students and young professionals network. The FIG Foundation, Trimble, Sam Inc., Leica Geosystems, Maryland Society of Surveyors, DC Land Surveyors Association, NSPS, David Doyle and David Weber. On the first day of the Esri UC, Monday 9 July, we will kick-off the FIG Young Surveyors Network Sessions at 12:00 o’clock in Room 25C. We will start with an introductory presentation by Brent Jones, Global Manager Land Records and Cadastre Esri. 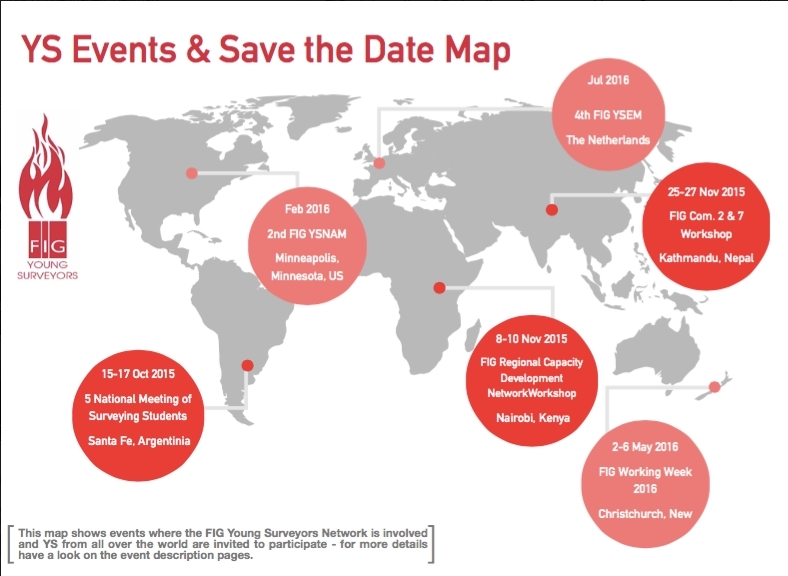 We will introduce FIG YSN in that session and Raquel Perez will present on the Esri Young Professionals Network. Then we will start with our very first session – Surveyors Across Borders: How Geospatial Education Differs. The goal of this session is to learn how the surveying/geospatial/GIS education is handled in different countries and what the major differences between them are. Several #YoungSurveyors will present on the educational system of their country, we will work on new ideas and learn from each other. So join us in this session! A big thank you to Esri, Esri Young Professionals Network and URISA who assisted in the process of making this happen. NSPS and the FIG Young Surveyors Network are pleased to invite you to the 2018 NSPS/FIG Young Surveyors North American Meeting. There will be sessions on the NGS 2022 Datum update, leadership, business, and technology. 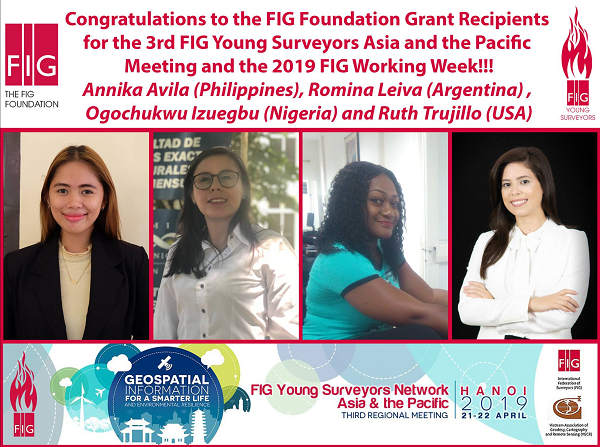 Congratulations to the FIG Foundation Grant recipients for FIG 2018! 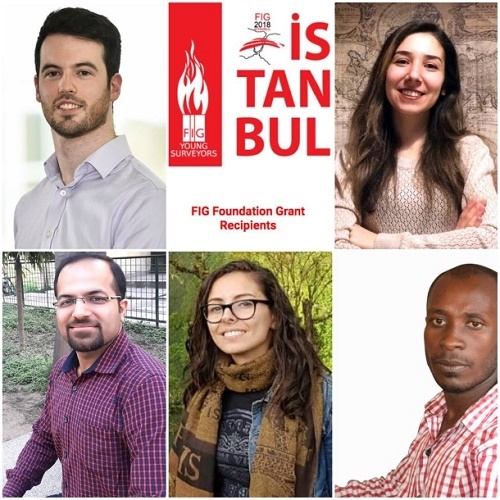 We want to thanks everybody who applied for the FIG Foundation Grant to attend the 4YSC and FIG Congress in Istanbul, Turkey. NB-Previous FIG Foundation Grant recipients are NOT eligible to apply. On the 28th of May 2016 the 5th FIG Yougn Surveyors European Meeting and FIG Working Week 2017 took place in Helsinki, Finland. The theme of the Working Week “Surveying the world of tomorrow – From digitalization to augmented reality“ reflects the continuous development around us. Tomorrow is only a short step away or maybe here already today. In total 50 enthusiastic young surveyors from 20 different countries gathered to share and explore the world of tomorrow with fellow peers with focus on two key themes: The evolution: 'Then, now and Beyond' and Delivering the Digital Dream. The full report of the event can read here. We are excited and look forward to seeing you!! !